As Beijing prepares to host the 18th National Congress, which will confirm the Chinese Communist Party's most radical leadership shake-up in a decade, beefed-up security in the capital and populist pledges aim at ensuring the event takes place in a "harmonious" atmosphere. The shape of the new ruling Politburo Standing Committee has taken shape, with three factions represented. By WU ZHONG (Asia Times Online). Recent signs strongly indicate that the Chinese Communist Party (CCP) is ready to convene the national congress that will select the country’s top leaders for the next decade. On August 17, President Hu Jintao and all other eight members of the Standing Committee of the Politburo met in Beijing with Chinese athletes who participated in the London Olympics, congratulating them on their 38 gold, 27 silver and 23 bronze medals. This was by no means just a piece of sports news. Since a reception on the evening of July 31 held to mark the 85th anniversary of the founding of the People’s Liberation Army (PLA), this was the first time the nine most powerful men in China had made a public appearance collectively. This signals that the informal “holiday” meetings of incumbent and retired top leaders at the summer resort of Beidaihe have been concluded. It is a well-known fact in China that the most important policies are normally set in Beidaihe, informal as the meetings may be. At the beginning of his first term of office, Hu once cancelled the annual Beidaihe meeting, only to resume it the next year. This underlines how retired leaders, especially Hu’s predecessor, Jiang Zemin, still retain their influence and want to have a say on major party and state affairs. This year’s Beidaihe meeting was of special significance. It decided on the candidates for the Politburo Standing Committee who then would be formally endorsed by the 18th National Party Congress. It also had to select a short list of candidates for the 25-strong Politburo, normally one or two candidates more than the seats, for the party congress to choose from. The conclusion of the Beidaihe meeting means a consensus has been reached on the composition of the CCP’s top leadership. As this is the most important item on the agenda of the 18th party congress, the congress opening is likely just a short time away – Hong Kong media have estimated it will take place between September 22 and November 25. While the CCP leaders gathered at Beidaihe, China’s official propaganda apparatus was gearing up to create a celebratory atmosphere for the convention of the congress. Major media outlets set up special sections to hail the country’s achievements in the past 10 years under the CCP leadership headed by Hu and to cover preparations for the event, such as the elections of the 2,000-plus deputies. The government of Beijing municipality, where the party congress will be convened, has also announced the establishment of an ad hoc high-profile security group to ensure no unpleasant incidents occur during the all-important party meeting. Beijing police have begun to round up beggars, petitioners and people without residency permits, and drive them out of the capital city. Beijing’s fire-fighting department has started to check, twice a day, on the venues of the congress, hotels where deputies are to stay, media centres and local airport and railway stations, according to Chinese media. To stave off public discontent, Beijing has stepped up efforts to address issues angering Chinese the most. Premier Wen Jiabao and other central government leaders have repeatedly pledged that the government won’t ease macro-controls designed to cool the property market despite economists urging Beijing to lift these curbs so increased investment in real estate could help stimulate growth. Beijing has also sped up clampdowns on corruption and criminal cases, especially involving senior officials. Last week, a court in Hefei, provincial capital of Anhui, passed down a suspended death penalty on Gu Kailai, the wife of disgraced Chongqing party chief Bo Xilai. This indicates that the CCP will soon decide on how to punish Bo himself. Late last week, Chinese media reports said the former minister of the railway, Liu Zhijun, would be brought to trial ahead of the congress on charges of taking huge kickbacks on high-speed rail projects and of sleeping with girls offered as “sexual bribes”. Liu was deprived of his party membership in May. At local levels, a number of corrupt officials are also being tried. On August 21, He Guoqang, a Politburo Standing Committee member in charge of the Central Commission for Disciplinary Inspection (CCDI) – the party’s top anti-graft watchdog – revealed that the party congress would take measures to “improve the anti-corruption system”. Beijing has also taken harsh measures to prevent the spread of rumours about the vital meeting, especially about the reshuffle of the top leadership, in fear that they would cause confusion in society and jeopardise the “harmonious” atmosphere. Still rumours continue to spread. Shortly after the Beidaihe meeting was deemed to have concluded, China-watching Hong Kong media reported different versions about the composition of the new Politburo Standing Committee. In this author’s view, the following one is the most probable. It is said that at Beidaihe, a consensus was reached to reduce the number of the Politburo Standing Committee (PSC) from the current nine to seven. This is nothing strange because there is no stipulation for any specific number. While it is now nine, at one time it was five, at another time seven – as long as it is an odd number (for the sake of a majority vote). Vice President Xi Jinping, 59, and Vice Premier Li Keqiang, 57, will stay on the the PSC while the other seven members will retire at this year’s congress. 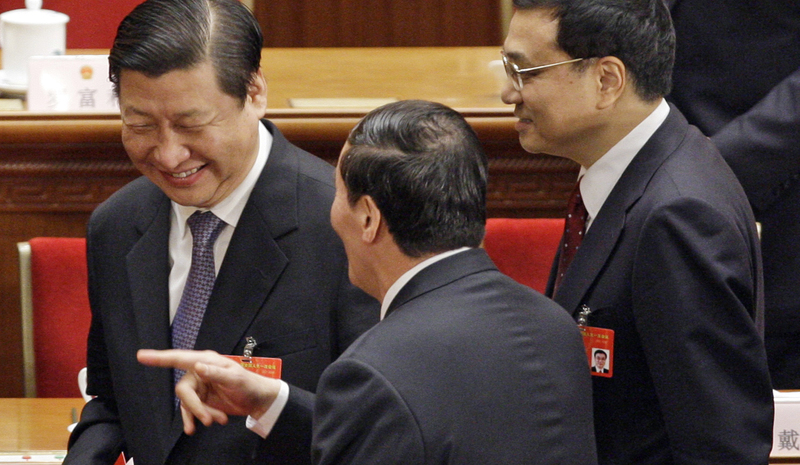 Xi is set to succeed Hu as China’s supreme leader while Li will replace Wen as premier. Wang Yang (57), currently Guangdong party chief and a Politburo member, who is likely to oversee party discipline and law enforcement, taking over the current portfolios of He Guoqiang and Zhou Yongkang. This list is probable because it shows a balance of power. Of the seven, Xi Jinping, Yu Zhengsheng and Wang Qishan are “princelings”. Yu and Zhang Dejiang are known to be proteges of Jiang Zemin. Li Keqiang, Li Yuanchao and Wang Yang are regarded as proteges of Hu because, like him, they all rose from the Chinese Communist Youth League.